7' 7" x 7' 11"
Though simple in design, the color of this Kurdish kilim is exquisitely beautiful. 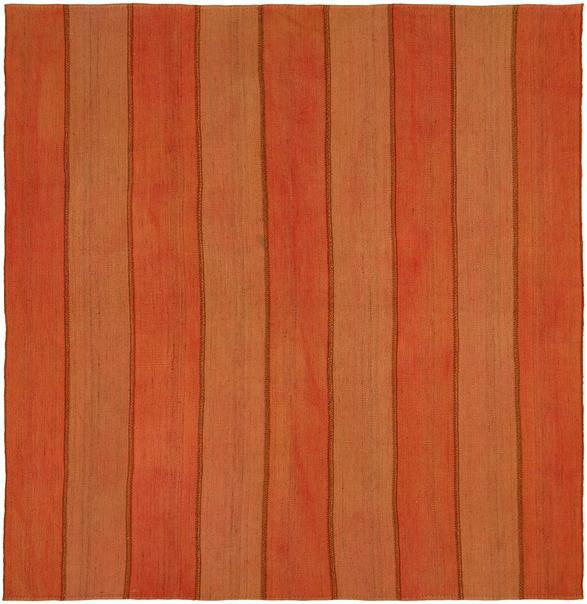 The field consists only of vertical bands alternating between dark pumpkin and light squash, with darker stitched embellishment accenting the edges of each band. Yet even the individual bands are full of variation, made up as they are of many different hues of color that blend into what appears as a unified tone. Even among Kurdish rugs, famed for their lovely palette, the color here is exceptional. Its beauty must be seen in person to appreciate it fully.